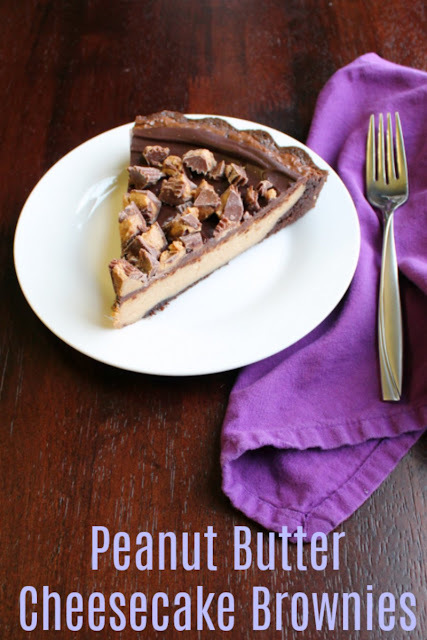 If you are a chocolate and peanut butter lover, this is for you. 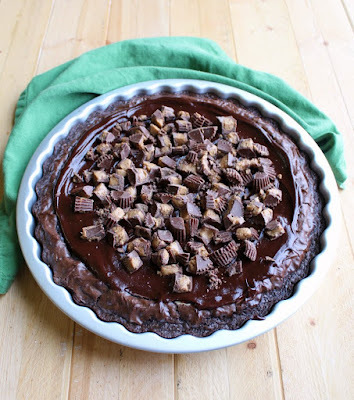 Rich chocolaty brownie peanut butter cheesecake goodness should be on your must make list. 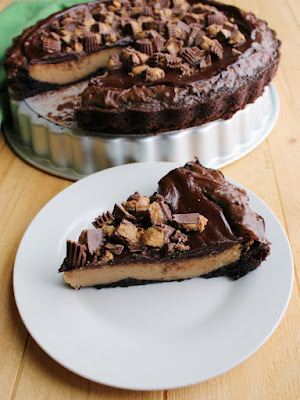 Take a layer of chocolate brownies and add peanut butter cheesecake. 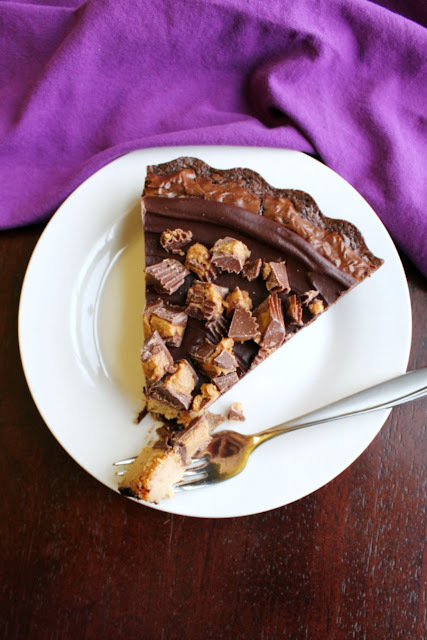 Now cover that with rich ganache and top it all off with chopped peanut butter cups. 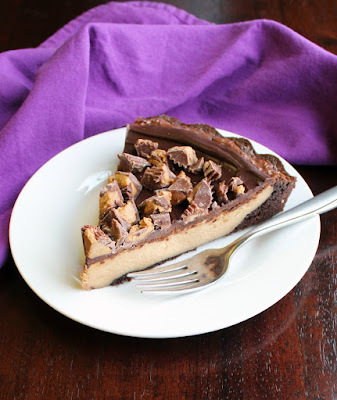 It's a rich sinful bite of heaven and you deserve a slice! I apologize for taking so long to share this recipe with you. I actually made it the first couple of times a couple of years ago. My sister was getting married and had a small reception for family at my parents' house. I got to be the dessert caterer for the event! She requested a plain cheesecake with a variety of toppings as the main dessert. In addition they requested an assortment of desserts. My mom and sister emailed me a variety of links for inspiration and I took bits and pieces of a few of them to create this fabulous creation. It was a smash hit at the wedding, so I knew I should share it with you. But here we are, my sister has had two babies already and I haven't shared the recipe yet. I promise I wasn't selfishly keeping it to myself. Actually what happened is my notes were written on the back of an envelope and it ended up in the junk drawer. I came across the recipe notes and figured I had better make it again right away while I had them.... who knows where they may end up otherwise! Luckily I had just enough chicken scratch on that envelope to piece the recipe together and the results were as good as I remembered! It is rich and decadent but so good and worth every calorie. 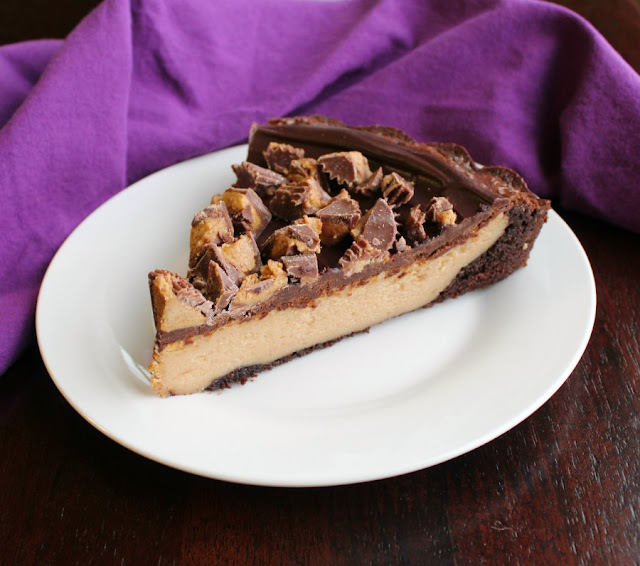 The mix of super chocolaty brownie and peanut butter cheesecake is always a winner. This makes that combination a bit easier than the buckeye cheesecake. I baked this is a 12 inch tart pan because I love the ruffled edge. However, don't despair if you don't have one. You could very easily make your showstopper dessert in a 12 inch skillet, a 9x13" pan or two 9" cake pans or pie plates. No matter what you bake it in, it is sure to be amazing! Be sure your cream cheese has plenty of time to soften and your egg is at room temperature. This prevents lumps in the cheesecake layer and makes it easier to spread. I've made the ganache layer with dark chocolate, semi-sweet and milk chocolate. We prefer the milk chocolate because it goes so well with the peanut butter cups. Any brownie mix will do, just make sure it's sized for a 9x13" pan. You can use two pie plates, two 9 inch cake pans, a 9x13" pan, or a 12" oven safe skillet if you don't have a 12" tart pan. 2. Mix together the brownie mix and the ingredients listed on the box. Pour into the prepared pan. 3. Beat the cream cheese until smooth and fluffy. Add the peanut butter and continue to beat until incorporated and smooth. 4. Mix in the sweetened condensed milk and egg, stirring until smooth and incorporated. 5. Spread the peanut butter mixture over the brownie mixture, leaving a gap around the edges for a crust. 6. Bake for 40 minutes. Remove from oven and cool completely. 7. To make ganache, warm cream and chocolate in microwave in 20-30 second bursts. Stir vigorously between trips to the microwave and stop cooking as soon as you are able to stir it smooth. Spread over cooled peanut butter cheesecake. Sprinkle with chopped peanut butter cups. Oh the ooohs and ahhhhs that will come from my family when I make this! Brownie Bliss! It is so good! I hope you enjoy it! Mine does too and it is so delicious. I am sure he'll love it! 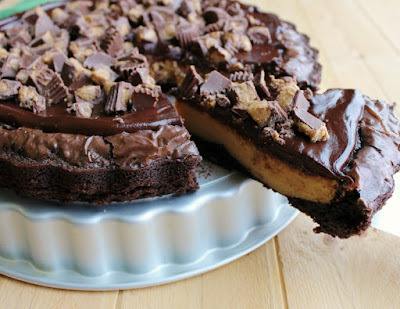 Your Peanut Butter Cheesecake Brownies look amazing! Hope you have a great Valentine Week and thanks so much for sharing with us at Full Plate Thursday! Hi Carlee, oh my! Just looking t this had me taking a slice of gingerbread out of the freezer just to satisfy that sweet tooth of mine. I would have taken out something chocolaty had their been anything... This sounds like cheesecake heaven and we do get brownie mix in a box here! Yay! It's my husbands birthday this week, and I just might have to find a spot in the week to showcase this beauty for him. I know he would love it! Mmm! I love that it sounds like he is getting multiple birthday treats! xox Tell him happy birthday from us as well!